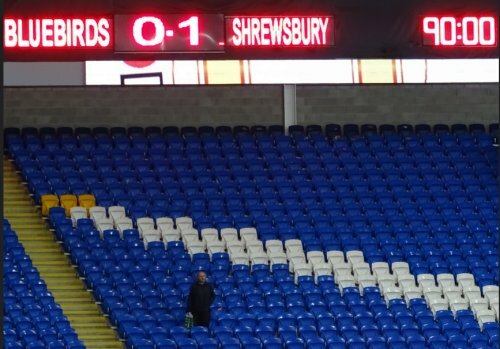 Less than 5,000 turned up to watch Russell Slade's flops exit the FA Cup with a 1 - 0 defeat to League 1 side Shrewsbury. A changed starting XI included Gabriel Tamas for his debut and saw rare starts for Federico Macheda, Alex Revell and Stuart O'Keefe. The game was played on a dreadful pitch but both sides made an effort in the first half with Sammy Ameobio's shot hitting the post the best chance of the half. After the break though City were pathetic. Macheda should have scored when clean through but the keeper saved. The winning goal came mid way through the half when Andy Mangan headed home when he found himself unmarked in the box. Bruno Manga headed wide as Cardiff's performance fizzled out. With an away trip to Hull on Wednesday and another away game at Wolves on the weekend it could be a very difficult week in Cardiff Cityland.